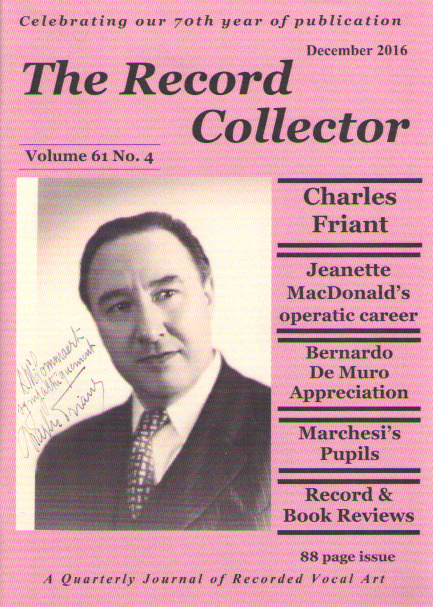 "No serious collector of old original vocal 78rpm records would ever even consider being without THE RECORD COLLECTOR, replete with an array of in-depth and informative articles on singers of the past, reviews of books and historical CDs, and numerous discographies (professional in that they offer matrix numbers, alternate ‘takes’, dates and places of recordings). THE RECORD COLLECTOR is a treasure-trove of invaluable information, and for those who do not already have their numerous out-of-print back issues, we are pleased to be able to offer them. Meanwhile, if you haven’t done so already, subscribe today!!!"